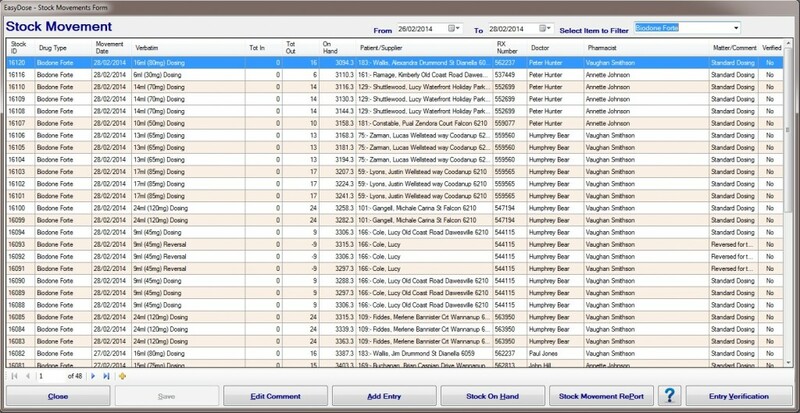 The Stock Movement Form combines all the separate Drug Registers into one simple computerised form which holds clear and precise detail for each entry. It is fast and easy to add, view, print and record incoming and outgoing stock movements. This form is accessed from the Main Menu > Stock or the Quick Access Menu. It shows ALL drug entries, incoming and outgoing, Dosing records and Stock Checks. It shows the Stock Levels on hand after each dose or entry. This form can be interrogated with a Date Range and Drug Type (filtering). As a filter option is chosen, the form contents changes immediately. To search and view transactions, open the form, set the filtering and view the record(s). Details are displayed in Descending order of entry. All Columns can be sorted into Descending and Ascending order by clicking on the header to assist is searching for and viewing records. All fields are locked and no record can be edited, obliterated or deleted. The ‘Edit Comment‘ button does allow entries to be edited/added to the Comment column. The ‘Add Entry‘ button opens a linked form, linked by Drug Type selected, and allows for the entry of Incoming Stock and all types of Stock Reduction. A Stock on Hand Report can be directly accessed from this form. The Stock Movement Report can be printed. It prints the same details as set by the filtering of the form. Verification of any entry can be made by a Level 1 or Level 2 Pharmacist. Intern entries can also be verified individually in the form.